Many of us are no doubt familiar with the Black Death, having read the chilling accounts of the Bubonic Plague that ravaged Europe over six hundred years ago. To this day, epidemics continue to haunt us. The epic 1976 film Cassandra Crossing captured with frightening imagery the death wrought by a new outbreak of the plague with repressive containment measures, sealed coffins, and masked men adding to the ghastly scenario unfolding in a train bound from Geneva to Stockholm. 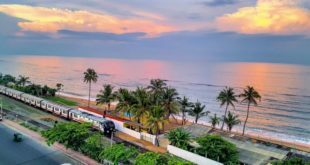 Delving deep into the copious pages of the Mahavamsa, an ancient chronicle of Sinhalese royalty compiled by a monk named Mahanama in the 5th century AD, we stumble upon a reference to a very frightening epidemic that ravaged our island in ancient times. It tells us that during the reign of King Sirisanghabodhi, a Yakkha (Demon) named Rattakkhi (Red Eye) came here and made the eyes of people red in different places. The people who saw the red eyes of one another, taking fright, died, whereupon the Yakkha devoured them. The Yakkha then appeared before the King and begged for oblations in every village to stop the killings. The King agreed and had him given the oblations, whereupon the deaths ceased. This ancient account is no doubt a reference to a fatal epidemic that swept through Sri Lanka in the 3rd century AD. 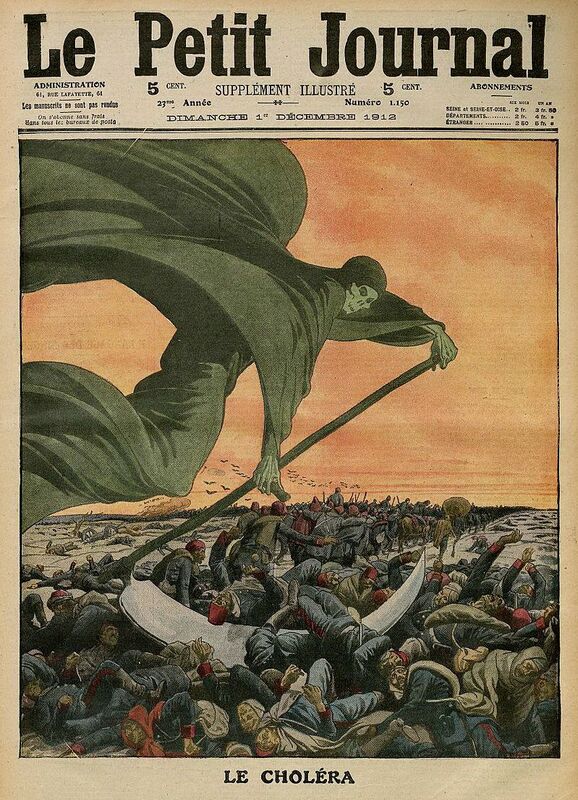 We cannot say for certain what it was, but given the allusions to red eyes followed by the death of the victims, we can only guess that it might have been an outbreak of a deadly mutant strain of cholera, which is caused by the bacterium, Vibrio cholerae. Cholera has been shown to be endemic to the mouth of the river Ganges (as explored in Amanda Thomas’s The Lambeth Cholera Outbreak) and all the evidence suggests that it had its origins in the Indian subcontinent before spreading to other parts of the world, with historical descriptions in Sanskrit writings being found as early as the 5th century BC. The heart, the fountain of heat and life, is overwhelmed with putrid effluvia, those who are seized with this disorder generally die, and that so quickly as in the space of four-and twenty hours at most. Particularly relevant to our story are the observations made by another writer that: “There is a very fatal form of disease also known in Travancore called “The red eye sickness” by the natives, which is evidently a modification of Cholera”(History of Epidemic Cholera by John Bell & Francis Condie, 1832). In fact, many early notices of epidemic cholera speak of a red appearance of the eyes, which, it is said, is a result of the absorption of the soft parts in which the smaller branches of the arteries are embedded, thus leaving the blood vessels to stand out like a network, in bold relief (Practical Observations of the Principal Diseases, W. L. MacGregor, 1843). When we talk of smallpox, we often think of faraway England whose Edward Jenner, we were told, came up with a cure for it. Little do we know that it once ravaged Sri Lanka as well, perhaps even before the British set foot on our shores. Smallpox is basically an infectious disease caused by the virus variola that gives its victims hideous bumps all over the body, filled with thick fluid. One-third of smallpox victims die of it. It is thought to have originated from a terrestrial rodent in Africa millennia ago, the earliest evidence of it probably being the pustular rash on the mummy of Pharoah Ramses V of Egypt, who died more than 3,000 years ago. What we were taught at school was that inoculation against the disease was discovered only in 1796 when Edward Jenner came up with a vaccination after noticing that milkmaids were generally immune to smallpox. Jenner inoculated little James Phipps with material from a cowpox blister obtained from a milkmaid named Sarah Nelmes. He called his matter vaccine from the Latin word for cow vacca. However, little is it known that inoculation against smallpox may have originated in China and was also well-known in Ottoman Turkey whence Lady Mary Montagu promoted it back in her homeland when she returned to England in 1718. The disease was finally eradicated only in 1978. The affliction may have been known locally as far back as the Pre-Christian era. Hugh Nevill, in the Taprobanian of June 1887, records a tradition that there once stood a gigantic Telambu tree amid a sacred grove on the site of the Ruvanveli Dagaba. This grove, he says, was sacred to Nava-Ratna-Valli, a form of Pattini as Kali, to whom human and other sacrifices were there made. When the Thera Mahinda selected the spot for the dagaba, the angry goddess is said to have scattered pestilence around the country and it was only after enormous sacrifices were made to appease her that her grove was felled and the dagaba erected on its site. The pestilence referred to what might well have been smallpox. In later times, we certainly know that smallpox was believed to have been caused by an extremely fearsome demoness known as Vanduru Kali, with relief claimed to be brought about by making offerings to Pattini, a female deity of South Indian origin (According to Kalpe korale adahili ha puda sirit, Horovpatane Pannananda, 2000). This is supported by the observations of James Cartman in his book Hinduism in Ceylon (1957). Cartman tells us that Mari Amman, the most common of the village goddesses, was regarded as the goddess of smallpox. “In her dance of frenzy” he says, “Mari Amman throws off pearls which, should they alight on anyone, produce smallpox”. The most dreaded disease among the natives themselves is the small-pox, which they regard as a pestilence, so much so that if a son, brother, wife or even one’s mother is attacked by it, the patient is immediately segregated in a separate hut built fifteen paces to leeward of their dwelling. His food is placed on a shovel and brought near his house but no human being would venture close to him, and he is thus left isolated; this is why a large proportion of them die. It was only in the days of British colonialism, after Jenner had improved on inoculation with his discovery of vaccination, that smallpox was finally eradicated. British Governor Frederick North came up with a scheme to eliminate it through inoculation by setting up four hospitals at Colombo, Trincomalee, Jaffna, and Galle. These hospitals were primarily tasked with the inoculation of healthy persons from the virus obtained from patients. In 1802, the possibility of vaccination called “Jennerian improvement” after its discoverer Edward Jenner became known in Ceylon. Conveying inoculating matter of the cow-pox to the island was initially thought difficult, North being of the opinion that the only way to do it was by sending out a sufficient number of persons from England or elsewhere to be inoculated, in turn, on the voyage, so as to keep the matter fresh. This method was however found to be unnecessary, as one of several threads steeped in the vaccine sent from Bombay was found to convey vaccine infection to a patient at Trincomalee, who was inoculated in 1802. The success of this particular thread brought about a complete change for the better in the country’s anti-smallpox campaign, as set out in the Collected Papers on the History of the Maritime Provinces of Ceylon by L. J. B. Turner, in 1923. Rabies, as we all know, is a very frightening disease caused by mad dogs infected with the virus, though (on rare occasions) it could also be transmitted by bats. Victims often show a great aversion to water in the final throes of death, which gave rise to its older name, hydrophobia or ‘fear of water’. This is also reflected in the Sinhala term for it jala-bheetika, Sanskrit for ‘water-fear’. This fearsome disease has been known since ancient times, with the Mesopotamian Codex of Eshunna C.1930 BC referring to it. It is also quite possible that werewolf legends, especially those that spoke of werewolf bite victims themselves turning into werewolves, were inspired by rabies victims. To date, only five people are known to have survived rabies after showing symptoms, and this only with extensive treatment known as the Milwaukee Protocol. 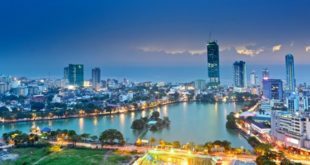 Local literature and folk beliefs testify to a knowledge of hydrophobia among Sri Lankans in the olden days. The Kali Yakini Kavi (dated to 15th-18th centuries) attributes hydrophobia to the ‘Black Goddess’ Kali, who, it says, caused dogs to go mad, inciting them to bite men. The victims were said to die if offerings were not made to appease her (from Sinhala Verse collected by Hugh Nevill and edited by P. E. P .Deraniyagala, 1954). Gopolu Yakseya, the demon of cattle, was also believed to be the cause of hydrophobia (On Demonology and Witchcraft in Ceylon, by Dandris De Silva, 1865). It was thought to be incurable except with divine help, for we have Major Forbes writing in his Eleven Years in Ceylon (1841): “The native doctors acknowledge their inability to cure hydrophobia, saying they can heal the bites, but the gods must do the rest”. The disease became quite commonplace during the British colonial period. Dr. Thomas Christie, Superintendent of Hospitals in Ceylon, refers to a young man with the name of Gorman, who, on admission to the Regimental Hospital, complained of difficulty in swallowing. He had, in the words of the doctor’s notes taken at the time, “the greatest horror at even the mention of liquids, great anxiety and violent burning sensations at the epigastrium, was constantly throwing out his saliva to a distance, at times outrageous”. He died the next day, notwithstanding the vigorous use of opium and mercury (from The Medical and Physical Journal, 1813). That it was not uncommon may be gleaned from the fact that the disease claimed as one of its victims, the well-known philanthropist, Charles Henry De Soysa, who in 1870 had entertained in lavish style the Duke of Edinburgh, the first Prince, of the blood royal of Britain that visited the shores of Ceylon. De Soysa was bitten by a mad dog and died of hydrophobia in September 1890 in the prime of life (Twentieth Century Impressions of Ceylon, Arnold Wright, 1907). 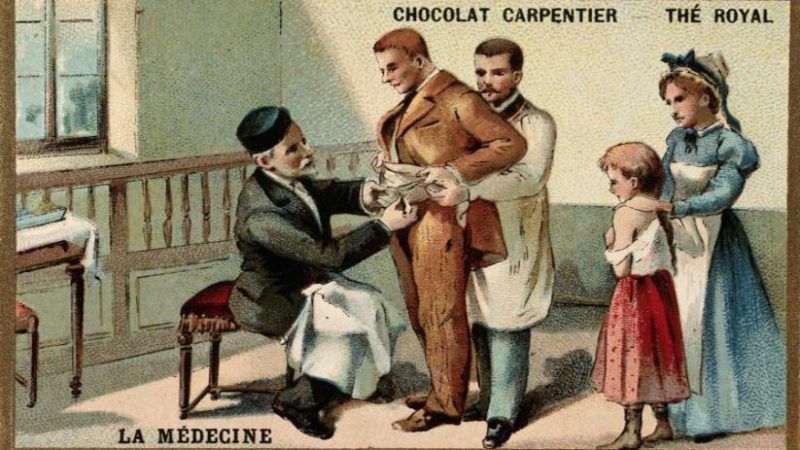 It was not until 1885 when Louis Pasteur and Emile Roux developed a vaccine that it came to be controlled, though British Ceylon lagged far behind Europe in eradicating the disease. It is a well-known medical fact that certain peoples are more vulnerable to diseases than others. And so it was with Parangi, a contagious skin disease said to have been introduced by the Portuguese that ravaged native Sri Lankans and lasted well into British colonial times. The ailment was originally thought to be syphilis, a venereal or sexually transmitted disease which shows in genital sores followed by abscesses and ulcers over the rest of the body, which in its advanced stages could affect the brain and cause death. “Syphillis they call parangue rere which means the Portuguese Disease; and they have reason for doing so, because it was we who introduced it among them”. Now, syphilis, we know, is a relatively recent disease, and seems to have been unknown to the Old World continents of Europe, Africa, and Asia, till Europeans started settling in the New World. There is reason to believe that it existed in the Americas before European contact, with some evidence to show that it was carried from the Americas to Europe by the returning crewmen of Christopher Columbus’ voyage to the new world. 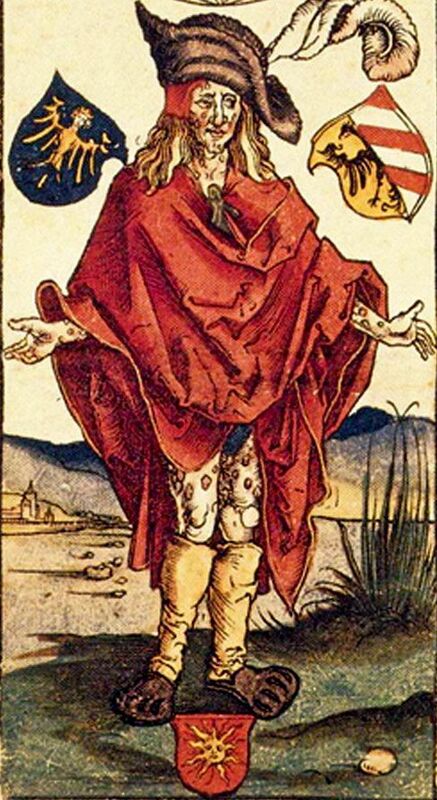 The first outbreak of syphilis in Europe took place during the French invasion of Italy in 1494-98. It was thought to have been spread by French troops, resulting in the people of Naples calling it the ‘French Disease’. The name stuck. The English called it ‘The French Pox’ and the Germans called it ‘The French Evil’. In India syphilis came to be known as Firinghee Rogan (‘Frankish Disease’), in Kashmir Garmi Firanj (‘Frankish Heat’), and in Persia Nar-i-Firangi (‘Frankish Fire’). In Turkey it was called Frank Zamiti and in Arabia Woja-ul-Ifranji, all of it connected to the Eastern word for the ‘Franks’, the Germanic tribe that gave its name to France. However, the Indian firanghi, as well as the Sinhala parangi, had also come to mean the Portuguese, the first European nation that colonised the east, and so were confounded with the Franks, who had centuries earlier been responsible for European incursions to eastern lands ‒ as part of the Crusades, for example. Thus, it is not surprising that the Sinhalese too should have called syphilis parangi, or to give its full name parangi leda, meaning ‘frankish sickness’. But did Parangi really mean syphilis? It was for long thought so, as we see from Ribeiro’s account. In later times, this view came to be disputed, as it did not show the classic telltale signs of venereal syphilis, with some saying it was a wasting ‘syphilitic disease’, and others saying it was akin to the West Indian Yaws or Frambaesia, a non-venereal contagious skin disease spread by infected sores such as by playing children, but which could develop to be almost identical to advanced tertiary syphilis. Frank Clemow’s Geography of Disease (1903) confidently gave Yaws or Framboesia as the most usual title for a malady which is met with in tropical and sub-tropical countries with names as various as pian in the French colonies, buba in Brazil, pooroe in Borneo, patita in Polynesia and paranghi in Ceylon. Clemow noted that the disease was characterised by papular eruption, turning to tubercles which were prominent and covered with a crust, which when removed revealed a reddish ‘raspberry-like’ surface, an appearance that gave the disease its scientific name of framboesia. He added that there were those who believed it to be a manifestation of syphilis. However, it was not until 1906 that the Italian Doctor Aldo Castellani, working in Ceylon, detected the organism responsible for the condition and called it Spirochaeta Pertenuis. This corkscrew-shaped organism or spirochete was the cause of the dreaded Yaws, and not surprisingly, it was a variant form of it, a spirochete of the genus Treponema (‘twisted thread’) that was found to cause venereal syphilis. 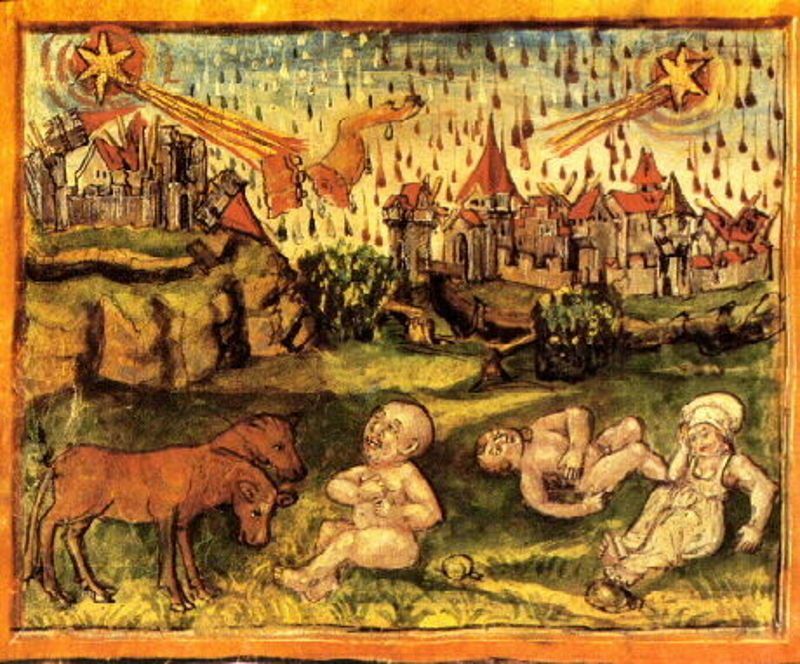 An old painting depicting the pass of Halley’s Comet in 1456. 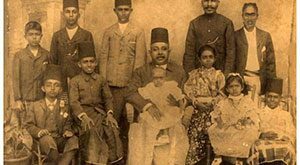 A little over a hundred years ago, in 1913, shortly before the start of the First World War, historian Paul E. Pieris published his best-known work Ceylon: The Portuguese Era. In it, he described an outbreak of an epidemic affecting both man and beast, following the appearance of a fiery comet with three tails on March 7, 1615. The fish, he relates, died in such numbers that their putrefying carcasses polluted the atmosphere and added to the prevailing unhealthiness of the season. Pieris was, of course, a historian, and his knowledge of it seems to have derived from a little-known Portuguese work titled Relacion Veradadera del Espantoso Terrempoto que el ano passado 1615 se vio en la isla de Ceilao en las Indias Orientalis meaning True Relation of the Terrible Earthquake that in the past year of 1615 took place in the Isle of Ceylon in the East Indies. It was printed with permission at Lisbon by Jorge Rodriguez and sold in his shop in the year 1616. “At last, one day, which was the 7th of March 1615, soon after prayers, there appeared in the air a terrible comet, which continued for many days to the great wonder of many but to the amazement of none. The comet had three tails, the end of which were like the heads of arrows, and so fiery and red that they seemed to be emitting rays of fire threatening therewith the total destruction of that island. This sign in the heavens ceased, God showed many others on land which being nearer to men might produce in them an effect which the other had not. There died animals on the fields and men in the city without any other cause of death than the infection of the atmosphere, without even time to confess their sins. There were thrown up from the sea, numbers of dead fish, so poisonous that all who ate them died, which caused much terror to all that there was no one who ventured to the beach to give them burial; thus the putrefaction and bad odour so infected the air that not men but even the animals of the air fell dead”. The work implies that following the appearance of the comet, a sort of miasma descended over the land, leading to an epidemic of immense proportions that killed man and beast, bird, and fish. Interestingly, comets, those icy wanderers wending their way across space and nearing the earth at certain times, have long been thought to portend evil or bring disease. Li Chung Feng, Director of the Chinese Imperial astronomical Bureau observed as far back as 648 AD: “Comets are vile stars. Every time they appear in the south, they wipe out the old and establish the new. Fish grow sick, crops fail, emperors and common people die, and men go to war”. “Death comes with those celestial torches, which threaten earth with the blaze of pyres unceasing, since heaven and nature’s self are stricken and seem doomed to share men’s tomb”. Could comets harbour disease-causing microbes which could be dispersed to earth as they streak across our skies? Rhawn Joseph and Chandra Wickramasinghe, the authors of Comets and Contagion published in the Journal of Cosmology of May 2010 think so. They argue that comets may well contain pathogenic microbes and that a comet’s tail may cross the orbit of the earth showering our world with what are called shooting stars or meteors, the resulting stellar debris that reach earth infecting birds to start with before spreading to humans. This is an interesting theory given that avian flu does have its origins in the skies. They even trace the influenza pandemic of 1918 that killed millions, infecting birds and then humans, to a comet, possibly comet Encke which approached close to the earth in 1914. 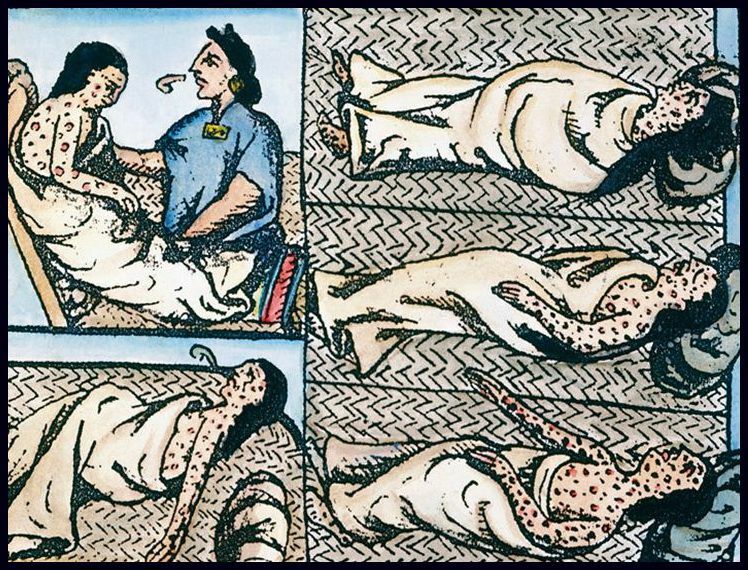 They also argue that the Black Death of 14th century Europe was triggered by a space event and contend that when a comet appeared in the skies over Mexico in the year 1519, witnessed by the Aztec Emperor Montezuma, it resulted in a plague that began to sicken and kill the native peoples. Could this explain the sudden appearance of epidemics and pandemics on earth? We still cannot say for sure, but the Portuguese account cited above does add some weight to it, given that it speaks of the infection of the atmosphere and birds of the air falling dead. Could it have infected the birds to start with, in the manner Joseph and Wickramasinghe argue for the 1918 influenza outbreak? Perhaps it is high time we looked to the skies for the answer.